Kate Middelton - Tiara or No Tiara? Home Fashion News Kate Middelton – Tiara or No Tiara? The world has been buzzing about the upcoming nuptials between Prince William and Kate Middleton for months now and as the countdown ticks closer to the actual wedding on April 29 the anticipation of the details just keep getting bigger and bigger. Aside from the biggest question of which of the three rumored dresses will Kate wear the next question is… will she or won’t she wear a traditional tiara? I loved this photomontage example of the couple in traditional wares. The Daily Mail UK has been buzzing about this topic for days. 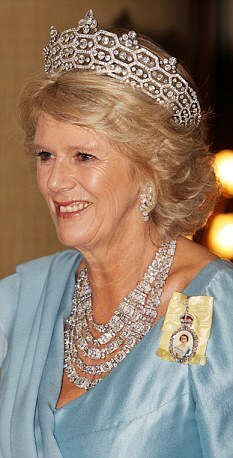 Rumor has it, that Camilla, Charles’ wife the Duchess of Cornwall and Kate’s future Stepmom –in-law would like for Kate to draw on the Royal tradition of wearing a tiara on her wedding day. Camilla and Charles being in their sixties are known for sticking more with traditional and patrician values, but simultaneously don’t want to seem out of touch or too old fashion. Camilla has however made it clear that she and Charles would prefer that the details of the wedding reflect values befitting a Royal affair. According to sources close to the couple, because William and Kate have attended a plethora of weddings within their peer group, they prefer to reflect a more modern less stuffy feeling at their wedding. 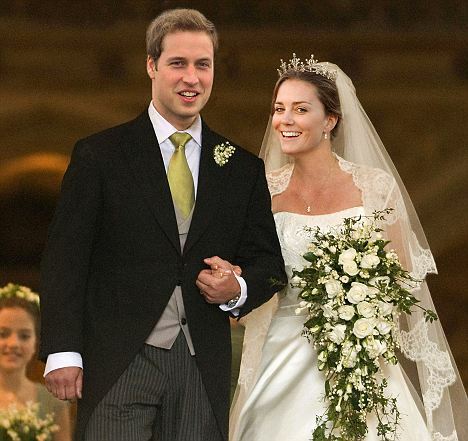 Kate and William’s preferences have been somewhat surprising on several notes. They have chosen to hold the ceremony at Westminster Abbey rather than the larger St Paul’s Catherdral and the wedding cake and grooms cakes are being baked not by a royal cakery but rather by popular bakeries that the couple and their friends frequent. 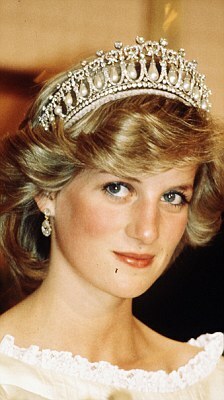 On Diana’s day, the Princess of Wales wore the Spencer family tiara, which had a diamond and gold scroll design. 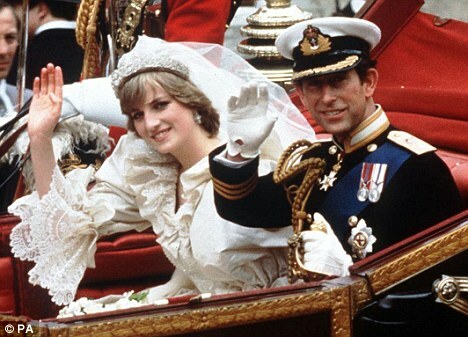 The Queen had given Diana the famous pearl and diamond Cambridge Lover’s Knot, but in the end it was deemed too heavy with her fairytale dress. The tiara itself was made with gems received as wedding presents by Queen Mary, wife of George V, and was modeled after a tiara owned by her mother, the Duchess of Cambridge. Since Diana’s passing the tiara has been kept in a safe at Buckingham Palace. Though Kate is still planning on adorning her locks with flowers, The Queen is hoping that The Girls Of Great Britain And Ireland crown might be the chosen tiara. This particular one was so-named because it was a wedding present for Queen Mary funded by young women. Rest assured in case you miss it, I will be watching just as I did when Diana married Charles upclose to the TV screen from the floor of my living roon in the midst of the night waiting for every detail…. And reporting it to you shortly thereafter!